Well that got your attention! But my title does not refer to the famous Voynich Manuscript, which a handful of people… myself included… have suspected of being a forgery. Nor is it one of the half dozen items which Voynich owned, and sold, or tried to sell, which I personally feel could be called under question. The BL needs to seriously update that. It seems to be based on Voynich’s original description of the work, and ignores that this has long since been identified as fake. But it is. It was originally identified as a work by the Spanish Forger, a very prolific artist… or more than likely, a group of artists, who worked somewhere in Europe from the late 19th through the early 20th century. I’m unclear who originally identified this as forgery, or a work by the Spanish Forger, but even in Voynich’s time it was questioned… in fact, he was questioned about it. At least by 1948 it was listed as a fake by Otto Kurz, in his book, Fakes (London, 1948). And by 1968, Janet Backhouse in her article, “The Spanish Forger” (The British Museum Quarterly, XXXIII, 1-2, 1968, 65-71), uses it as a good example of the work of that forger. However, by the time William Voelkle compiled the book, “The Spanish Forger” for the Pierpoint Morgan Library in 1978, the attribution of this work was not so clear: It is pictured, and listed in that work as “OL4”, for “Other [forger than the Spanish Forger] Leaf 4”. However I’m not myself adequately prepared to judge exactly which forger this is by, although I have my lay opinions on the subject. Suffice it to say that the consensus is that this is a forgery. 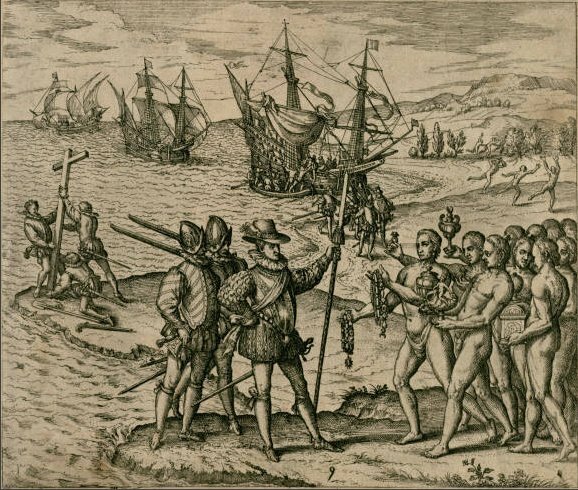 “… said that he had bought it from another bookseller, at a high price, as a picture of the landing of Columbus. He himself suggested that it might in fact be meant for Cortéz, probably on account of the rather eccentric coat-of-arms on the flag, which appears to quarter the arms of Castile, Aragon, Granada, and Navarre. 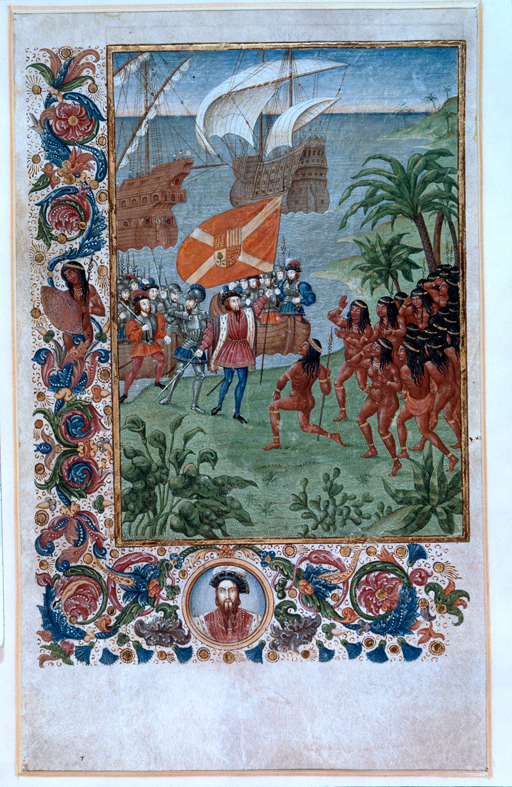 Navarre was not in Spanish hands until 1512… … Voynich thought that the miniature might have been a frontispiece to Cortés’s official report to the King of Spain”. I agree with Ms. Backhouse, it is not at all convincing. Note the broken chain of ownership, which isolates Voynich from any possible blame. I would go further than that… I think that fuzzy and bizarre provenance is so sketchy that I sense Voynich also knew it was very poor… or, dare I say, he knew it was a lie? “Mrs. Voynich is an English woman and is married to a Polish Count”. Such references seem too fade out by the early years of the 20th century, however. They are soon replaced by the more exciting reality of Wilfrid’s revolutionary background, and his extraordinary success as a renowned book dealer and collector. So then I find it doubly odd that he was suggesting that this forgery may have been sold to the (by then nameless) French dealer (who sold it to the nameless British dealer) by a “Polish Count”. Go figure. In any case, this is a forgery, and really… like most Spanish Forger works, and associated works, not really that good a representation of what was real. And of course I can’t, and don’t, say this is a clear smoking gun in Voynich’s hands. But in light of the questions about it and its provenance, and the really poor answers that Voynich gave in response, when seen in the back drop of his other vague, and ever-changing stories of provenance for other works, are for me, all serious causes for concern. He is even caught in a provenance lie or two… think, “Castle in Southern Europe”. So for me, this example adds to the question of just how much Voynich really knew about the sources, and authenticity, of what he was willing to sell… and what he was willing to say to do so. This entry was posted on September 22, 2014 at 11:47 am and is filed under Dating the VMs, history & provenance. You can follow any responses to this entry through the RSS 2.0 feed. You can leave a response, or trackback from your own site. This is a coincidence. 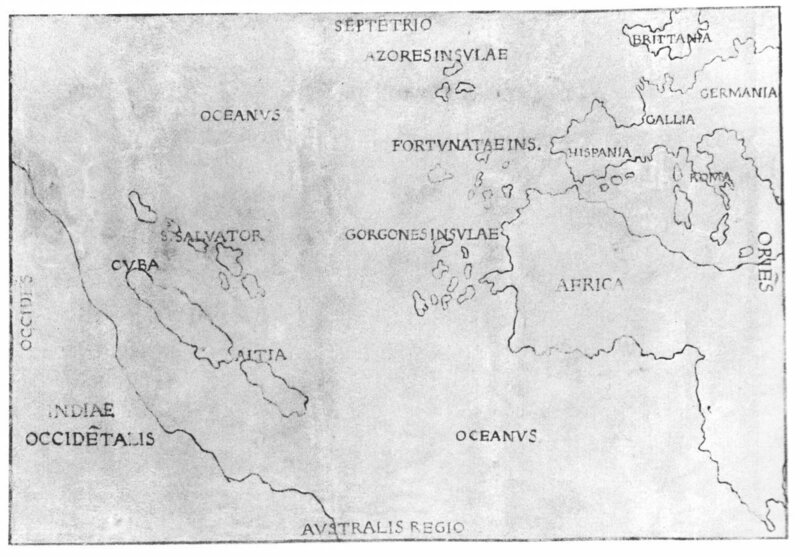 I wrote about the same picture – but unlike you, I hadn’t been able to get hold of a picture of the map. On the same topic – I’ve seen you copy a page of Voynichese very rapidly. How long do you think it would take someone equally accomplished to do folio 86v? I think it would take days, if not weeks, wouldn’t it? All that detail! Hi Diane: Yes I have since seen your mention of this work. I also wondered why the British Library has not updated the discription on the page, considering the catalog does imply they accept it is a forgery. As for the change from a “Spanish Forger” attribution, to “other”, I’m not sure just when this occurred… but it is describe as “other forger” in a 1970’s book on the Spanish Forger. The thing is, I personally believe it is a mistake to identify only those works strictly in the first style identified by Greene… because although slightly different, many other forgeries of the same time could likely have come from the same (assumed) “forgery factory” that the Spanish Forger works came from. At least, there is an overlap of genres, materials and styles into the Spanish forger works, which may just imply the source… one or more artists… may have simply been adaptable to the markets, as well as prolific. As for the time to make the illustrations of folio 86v, I would say possibly a good portion of a day, maybe, at the most. But to put my money where my mouth is, I’ll give a large complex page like this a shot sometime (soon? ), and see if my guess is correct. The simple page I made took 13 minutes, and Gordon Rugg made a much more detailed and quality page… I think that took him less than two hours, maybe less than one. I don’t recall exactly, you could look that up… it is on his blog. All the best, Rich.